Be Pup-pared this 4th of July! Did you know more pets run away on the 4th of July than on any other day of the entire year! The 4th of July is supposed to be a day dedicated to celebrating America, but we can’t forget about keeping our furry friends safe during the festivities. We’ve come up with a list of tips and precautions to make sure your pets stay safe during this upcoming holiday! Tip 1: Try to wear your pet out before leaving them. Taking your pet for a walk, playing fetch, or having them play with one of their favorite toys before you leave them to enjoy your 4th of July festivities is a good way to make your pup tired and worn out. This way maybe he or she will take a quick snooze while you are out and about enjoying yourself. Premium Pets carries a wide variety of toys like this Chuck It Ball! Tip 2: Don’t bring pets to the firework display/show. You’re probably thinking, well duh! But you would be surprised by how many people think it’s a good idea to bring along their pup to see the show. Even if you think your friend wants to come along, they definitely won’t want to be there once the booms and crackles begin. It’s best to leave your pets in the comfort of their own home! 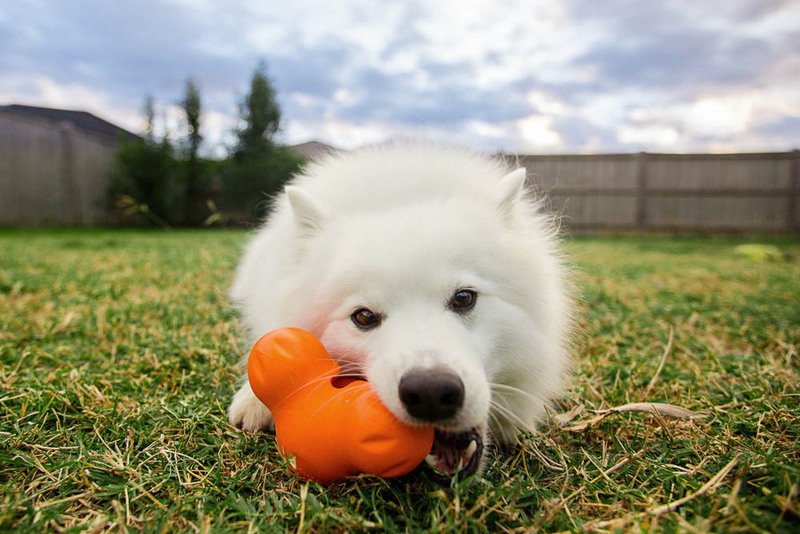 West Paw toys come with a product replacement guarantee and there are plenty of sizes and shapes to chose from for your dog! Buying your pup a new toy or frozen treat will help keep them busy and occupied. This interactive puzzle with a treat dispenser from West Paw will keep your pup busy while your gone! If they’re enjoying themselves they won’t be focusing on all of the firework displays outside of their home or worried about where their family is. Tip 4: Don’t feed your pets table scraps. If you end up letting your pup tag along for the family or neighborhood barbecue, make sure they stray away from table scraps. Sudden changes in a pet’s diet can cause their stomach to become upset. Always avoid giving your pup bones, especially chicken. Other toxic food scraps to never give to your pet include, grapes, onions, and fatty or fried foods, just to a name a few! Tip 5: If you know your pet struggles with anxiety, consider giving them a calming supplement to ease their nerves. Voila! Calming supplements for both dogs and cats! Now you don't have to stress and neither do your pets! Some owners know from past experiences that their pets struggle with severe anxiety. If that’s your pup, you might want to consider buying a calming supplement or hemp oil. There are plenty of natural supplements that can calm your pup down. NaturVet’s Quiet Moments Calming Aid can help ease your pet’s anxiety just 5 minutes after taking the chewable tablet and lasts all day while hemp oil has active CBD and truly brings harmony to the pet. Both options are available at Premium Pets! Tip 6: Make sure your pet has identification tags. Like mentioned before, the 4th of July is the number one day that pets go missing, so it’s important to make sure that they have their identification tags. When pets hear fireworks, they get scared and are desperate to find their owner, which can result in them getting lost. In case they do wander off and end up getting lost, their identification tags, with their name, address, and owner’s phone number, can help with their safe return home. Follow these tips and tricks so that you are pup-pared to keep your pet safe during the upcoming holiday. Have a fun, safe, and exciting 4th of July!